Many small and large businesses are using WordPress internally as a collaboration tool by combining it with tools like edit flow, user role management, and to do lists. Using WordPress as an internal communication system is proving to be very effective for these organizations. In this article, we will show you how to make an internal communication system in WordPress using P2 Theme. P2 is a WordPress theme which transforms a WordPress powered site into a Twitter-like real time status update, blog posting, commenting tool. It eliminates the need for going to the admin area to write a post. You can post right from the home page of your site. It has threaded inline comments which appear under each post on the front page. 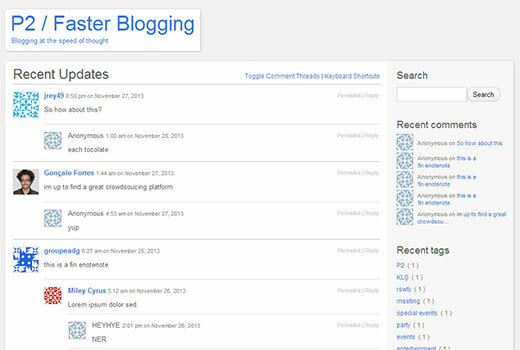 It is powered by Ajax which makes posting and commenting super fast. The most famous example of a P2 site in action is the WordPress Make site. Where developers, contributors, and other WordPress users can participate in discussions surrounding the WordPress development. 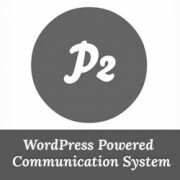 P2 can be installed on any WordPress site. Since we are showing you how to use it as an internal communication system, we are assuming you might want to keep it private. The first thing you would need to do is install and activate P2 theme on your local intranet or on a subdomain. Once you have activated P2 theme, then you need to go to Appearance » Theme Options. On this page, you can choose a custom background color, select a background image if you want, hide the sidebar and titles, etc. But most importantly, you can set posting access here. Check the box next to allow any registered member to post and save your settings. 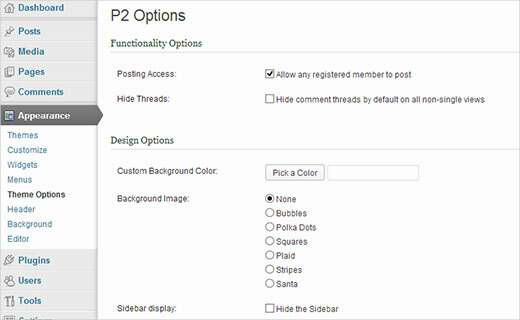 Now that we have enabled posting access in P2, the next step is to open up your site for user registration. All you need to do is go to Settings » General and check the box next to Any one can register field. Since P2 is designed to encourage discussions, comments are an integral part of its design. You can go to Settings » Discussion and check the box next to ‘Users must be registered and logged in to comment‘. So far we have enabled user registration and allowed those users to post on the site. Next you would want to add login and registration forms to your website. 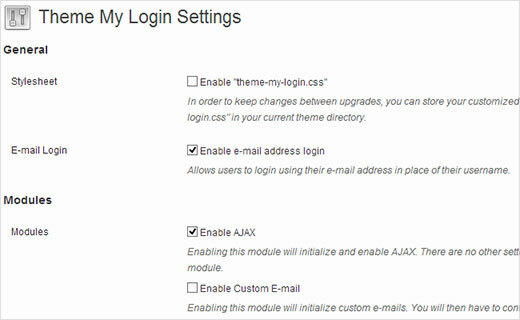 To add front-end login and registration form, we recommend that you install and activate the Theme My Login plugin. Upon activation, the plugin adds a TML menu item in your WordPress admin sidebar. Clicking on it will take you to plugin’s settings page. On the plugin settings page, check the box next to Themed Profiles option and hit the save changes button. You will notice that a new menu item for ‘Themed Profiles’ would appear under TML menu. Click the button, and it will take you to themed profiles settings. 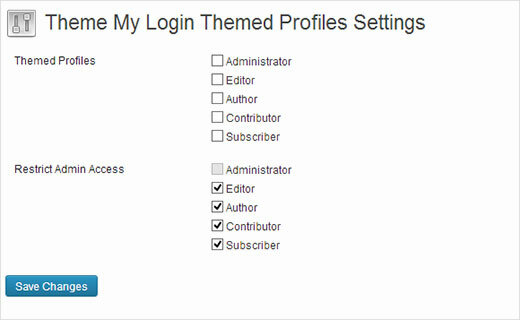 Here you need to restrict admin area access to all user roles. This will protect your WordPress admin area, and all users including administrators will be redirected to a login form on the front end of your website. As an admin, you can go to admin area by typing the URL in the browser. You will be redirected to admin dashboard after login. Other users will be redirected to their themed profiles. Now it’s time to add login form to the sidebar. Simply go to Appearance » Widgets and drag and drop Theme My Login Widget to your sidebar. P2 Theme has a very simplistic layout and there are very few things you can do to enhance its appearance. You can upload a custom header image from Appearance » Header. You can also choose a custom background from Appearance » Customize. However, if you would like a complete make over, then there are a few P2 child themes available for you to use. Alternatively, you can create your own child theme. You can use all WordPress plugins with your P2 Theme. For example, you may want to monitor user activity or add social media plugins. However, there are some plugins that are specifically written for P2 and you would want to give them a try. More Privacy Options – Allows you to make your P2 Intranet Site viewable only by registered users. P2 Likes – Adds an option for users to like a post or comment. That’s all. You now have a powerful WordPress based application set up to communicate internally with your colleagues and team members. You will soon find out that P2 not just improves communication among team members, but it also makes thing fun and interesting. Let us know how you are using P2 in your comments below. Good Post but i want to create my own social network website using this theme (P2) what about showing posts only to followers, and following others and such kind of activity is not there can you help me? Great post! P2 is now no longer being developed, unfortunately, but I still use it as a private social network for my extended family and it works great! Adds support for Jetpack Infinite Scroll. Hard to believe that a theme like this doesn’t have this feature built in, but this adds it! Turns posts into excerpts with a “Show More/Less” link that loads right in the page. Also converts the first image into a thumbnail in the excerpt. I’d rather have this a a landing page for the Backend itself. This way, the original theme was kept for the public /WHILE/ the editors primarily work with P2/O2 right after logging into wp-admin. At the same time, they can simply transfer media and text into articles to publish on the site right; buttons right at their fingertip in the left hand menu. Great post! What would be the most convenient way to create a safe private communication system in public subdomain? By setting the directory password protected? It is always recommended to add layers of security. Setting directory password using .htaccess is safe enough, but you can also require all your users to be logged in to read any posts on your site. On WordPress login page you can add two step authentication and limit password attempts to make it even more secure. Your users can store their passwords in their browsers or use addons like 1password to store all their passwords. Thanks for tips! The two step authentication would be best to handle with..? I found that there is a login possibility in TML but no 2 step verification. Contact plugin support someone may have already asked for this feature there. If you like P2 then you might want to sign up for info on O2 http://geto2.com/, O2 has been in development for some time so should be very interesting.